Linear, C-rich, ssRNA(+) genome of 6.3 kb. The 3'-terminus has a tRNA-like structure. The virion RNA is infectious and serves as both the genome and viral messenger RNA. The ORF1 encodes a polyprotein whichis expressed by leaky scanning. 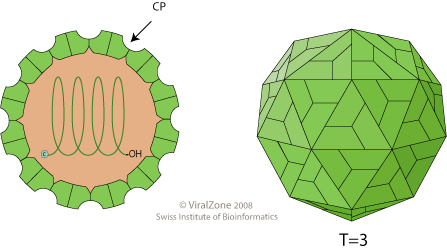 The capsid protein is translated from a subgenomic RNA. TRANSMISSION Mechanical, vector=insects (beetles). Present in sap. Turnip yellow mosaic virus 98K replication protein counteracts degradation of the viral RNA-dependent RNA polymerase (RdRp) by host ubiquitin-proteasome system. The 98K replication protein mediates deubiquitylation of RdRp leading to its stabilization .